Welsh Sheep Farmer's Daughter Got it Baaaaad! Shwmai. Been riding bikes all my life. Grew up riding round fields in the hills of Wales, UK. FINALLY, found a bike that suits me. It's a 2009 Harley Davidson 1200cc Nightster, silver and black, and stage 1. I am now going to put 12" mini apes on it. Still trying to work out which screen will fit with said mini apes. The bike feels like a proper bike like (that's how we speak in Wales - we put "like" at the end of everything). To me the bike feels more like an off roader. It really handles corners well - thank good the previous owner took off those dreadful bits of metal prong things on the end of the footpegs. Really put me off cornering around roundabouts on my last bike 883Low. This new bike is a right rasper. Great, man. Now I am keen on biking again. I didn't realise how much my 883Low put me off biking. Just didn't have the pzaz of this one. Nothing wrong with the Low but now I am SO keen to go out biking again to show it off to everyone. I even cleaned it the other day AND it wasn't dirty! Must get an open face helmet so everyone knows it me going past in the village - hey hey. 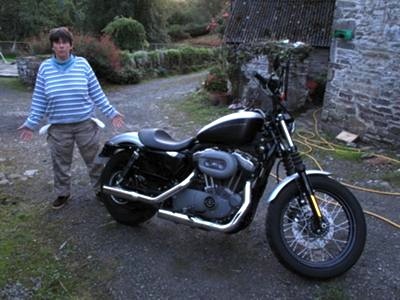 If my bike gets bike of the month please give an equivalent of my prize to a motorcycle charity. Cheers. Keep biking. Hwyl. Comments for Welsh Sheep Farmer's Daughter Got it Baaaaad! Hi Poose....amazing bike! Hope you have lots of happy and safe riding! God Bless from Oberlin, Ohio, United States Oh Ya...i love the your picture...so cute! Love your bike, love your empty pockets. LOL. Glad you're having fun like. That is one powerful bike you have there. I was fortunate to spend a week riding one last summer. The only downside was she had Screaming Eagle pipes installed and the bike was really too loud, especially in the city. It was loads of fun. Enjoy!